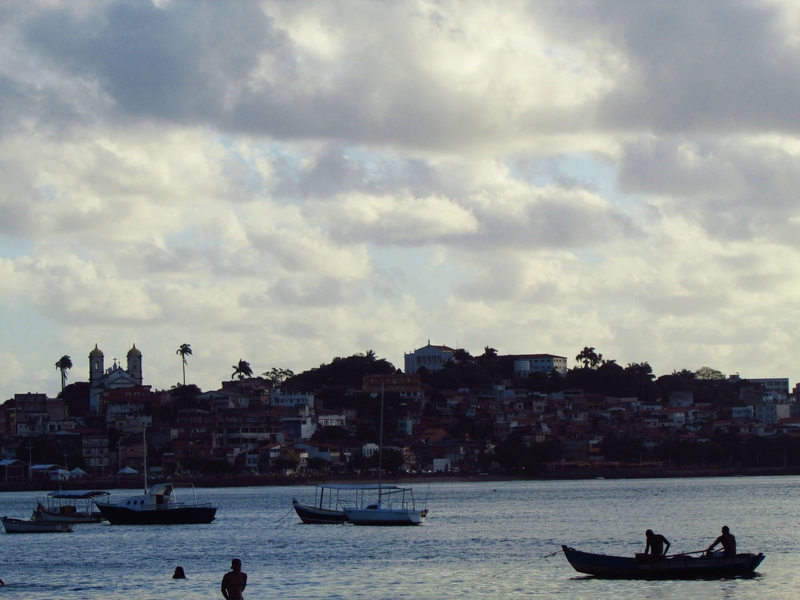 Salvador and to a larger extent Bahia (the state) is definitely a different kind of Brazil than what I had seen the week before. I felt quite often like I was in Africa, a feeling that a lot of people we met shared. 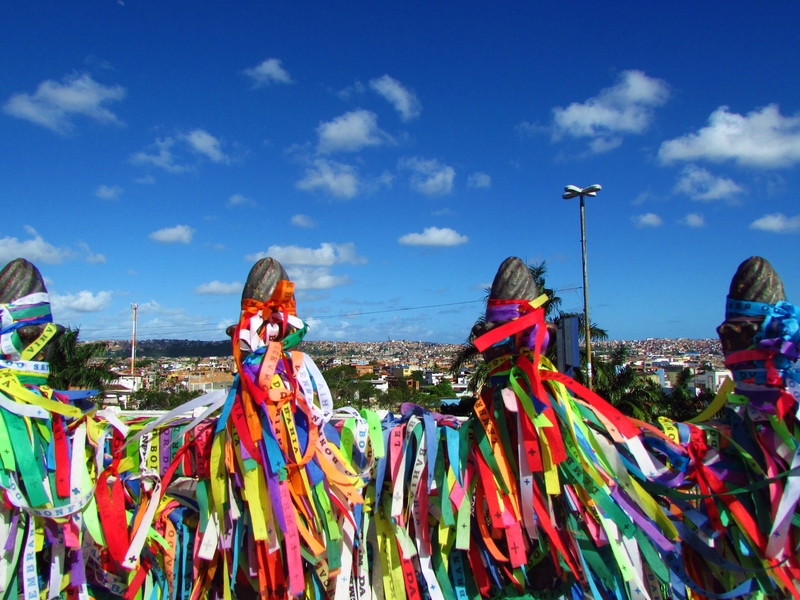 Part of the feeling was because of the kind people that walked around in Salvador. 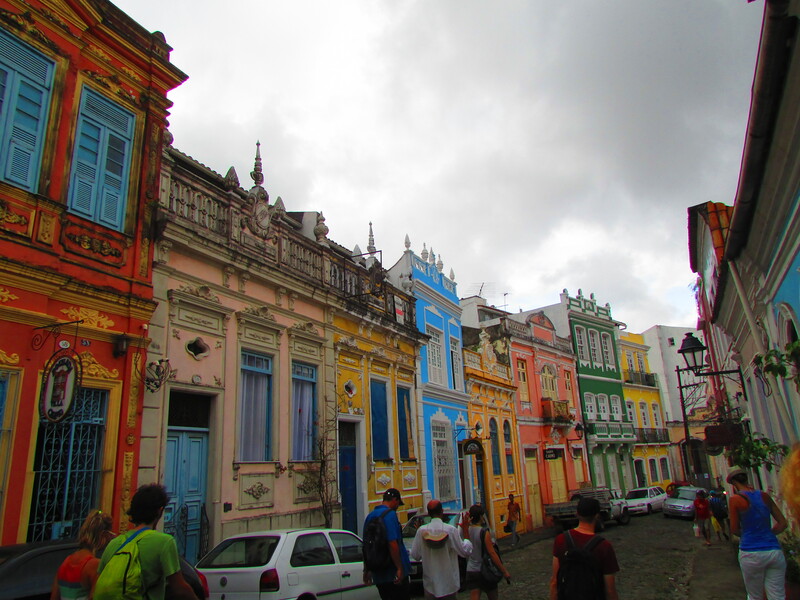 Where Rio was more mixed, Salvador was mostly black, and I felt very different as a white blond chick. We were often stared at in a not very subtle way, but weren’t really hassled. The reason for such an abundance of black people is because of the colonial history; Salvador used to be the very first capital of Brazil, and since the Portuguese didn’t want to live/work in the scorching heat closer to the equator, they imported slaves from Africa to work on the plantages. The Portuguese left at a certain point, discovering more southern parts of Brazil, leaving Salvador behind in its decay. This is another factor that made it feel like Africa; the state of the infrastructure and buildings and roads etc. 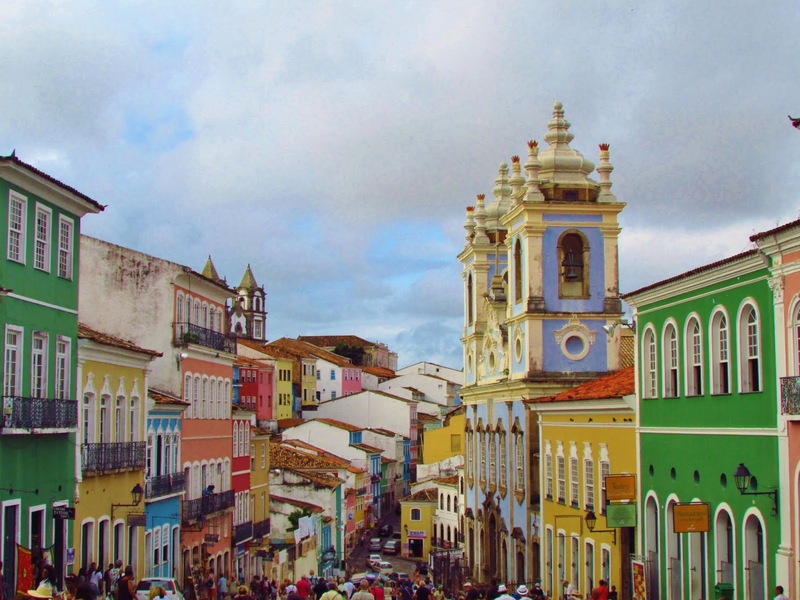 After the colonizers weren’t that interested in Salvador anymore, it was left to rot, which is kind of noticeable. There have been huge restoration projects a few decades ago in cooperation with UNESCO to restore the city to its former glory. This resulted in the most joyful buildings I’ve ever seen, all in a different candy cane vibrant colour. But this is mostly the central neighbourhood Pelhourinho, whereas the rest of the city seemed poorer. Fortunately our hostel was in the centre of the city. All day long there was music coming out of the streets, bossa nova and samba was played by either musicians or men walking around with wheelbarrows with huge music boxes in it. (I still don’t get why they did that because they weren’t asking for money…but you won’t hear me complaining!) which created an amazing atmosphere. 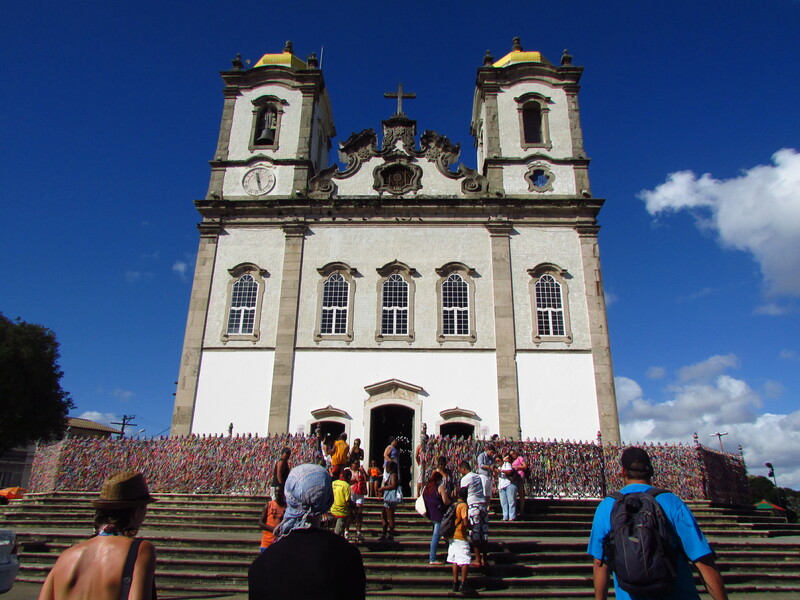 We randomly stumbled into this church with an abundance of colourful bracelets tied to every possible part of the church, and only later discovered that the Igreja de Nosso senhor do Bonfim is famous in all of Brazil, and the bracelets are a symbol of Salvador and found literally everywhere. we all tied one around our arm with three knots and made a wish for each knot. We went to a beach with some people from the hostel where tourists don’t really go, which was noticeable since we were the only white people on the beach (I should tan a bit more…) getting back to the hostel wasn’t that evident since busses were kind of dangerous at night and there were absolutely NO taxi’s passing. A friendly barman offered us to wait inside (and didn’t even push us to order something) and called us 2 taxi’s that arrived more than half an hour later. We took a walking tour the next day from a friend of the hostelowner who showed us around the centre. In the end there wasn’t a lot to see in Salvador, almost everything he showed were churches, and the place where Michael Jackson filmed his videoclip of “they don’t really care about us”. 24 years later and still a popular hotspot for tourists! 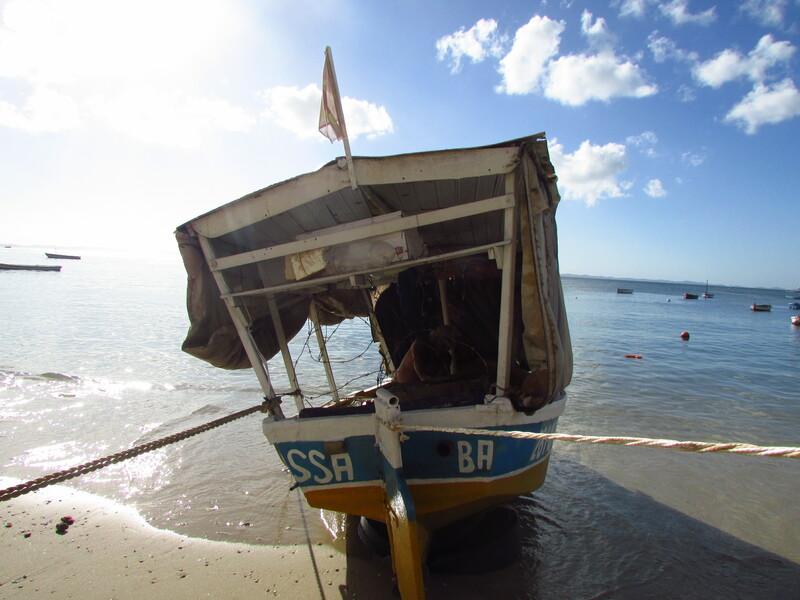 But the guide was super friendly and explained us over free caiperinha’s about the African religion he and many people in Salvador uphold, the Kandomble. Most of the sermons are happening nowadays in the catholic churches because the Kandomble is getting a lot more popular than catholicism (even though Brazil remains the most catholic country in the world). We could have participated in one, which apparently would be very interactive with singing and dancing but we had to leave the next day. 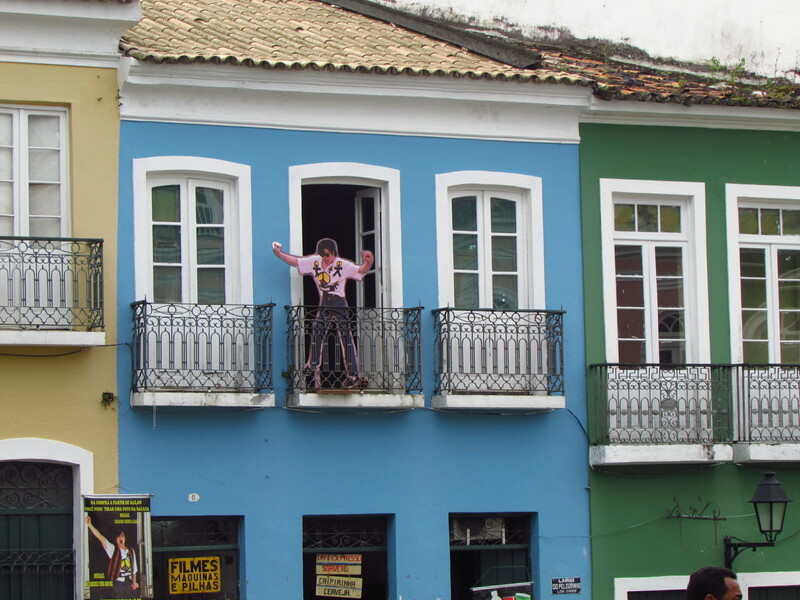 I’ll remember Salvador as a very colourful but very complex city, with a big African vibe to it.